A dancer performs at a temple ceremony in Tampaksiring, a village not too far from Ubud. 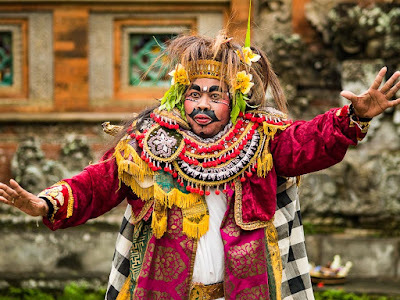 I covered a temple ceremony in Tampaksiring, a village near Ubud, while I was in Bali. Most of the people on Bali are Hindus who celebrate their faith in a very public way. Bali uses two calendars. Business and government use the Gregorian calendar but private and spiritual life in Bali is governed by the Balinese calendar. 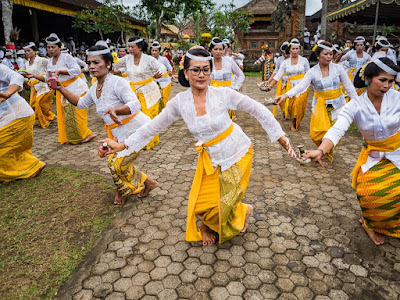 The Balinese year is 210 days long (only seven months in the Gregorian calendar). 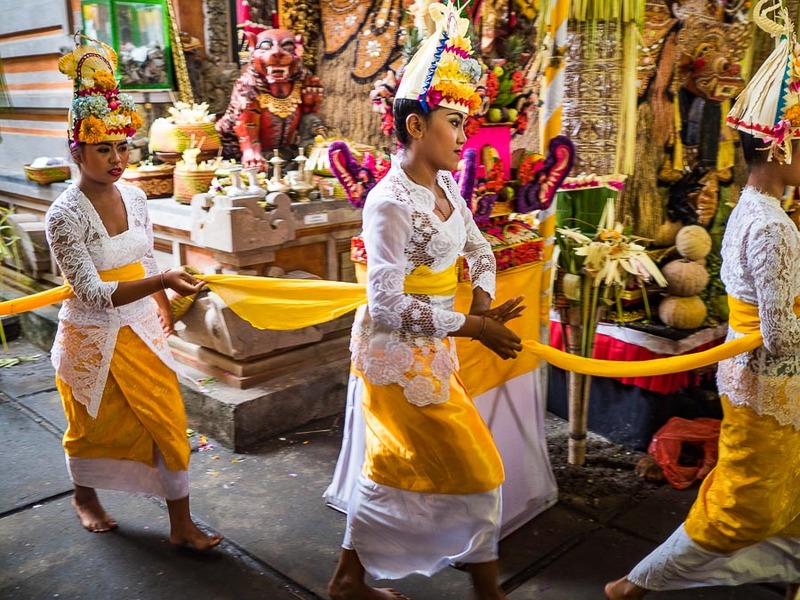 Bali is dotted with temples. 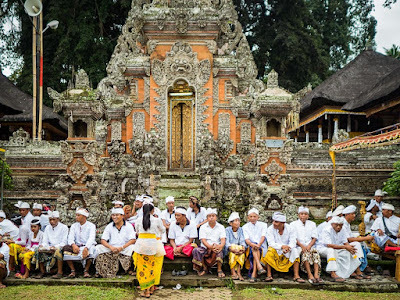 Proportionally I think there are more Hindu temples on Bali than there are Buddhist temples in Thailand or Christian churches in the US. Every village has at least one village temple and almost every family has a family temple in their compound. (Family compounds are really more like tiny villages because they are home to not a "nuclear family" in the American sense but an extended family of several generations.) Every temple has an annual founding ceremony, but since it's annual on a Balinese calendar, which is seven months in the Gregorian calender, when you do the math you discover there are temple ceremonies almost everywhere almost all the time. 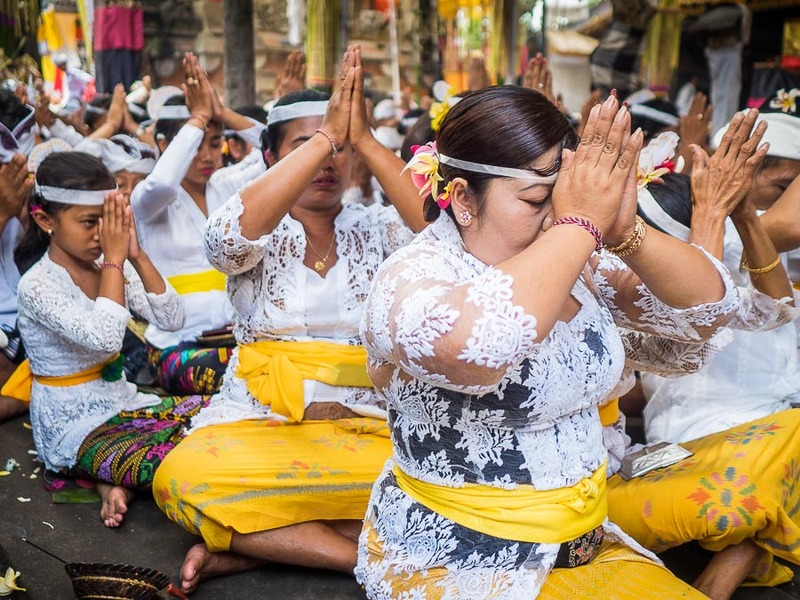 Women praying at the Pura Agung temple ceremony in Tampaksiring. 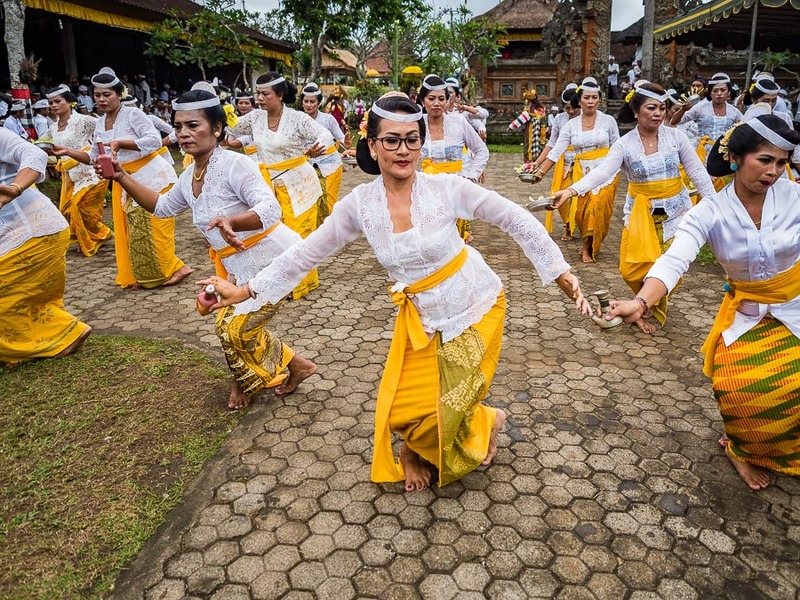 Which is why I went to Tampaksiring for their annual (on the Balinese calendar) temple ceremony. As luck would have it, the cosmos aligned almost perfectly to make this the most important ceremony in the temple in about 50 years. 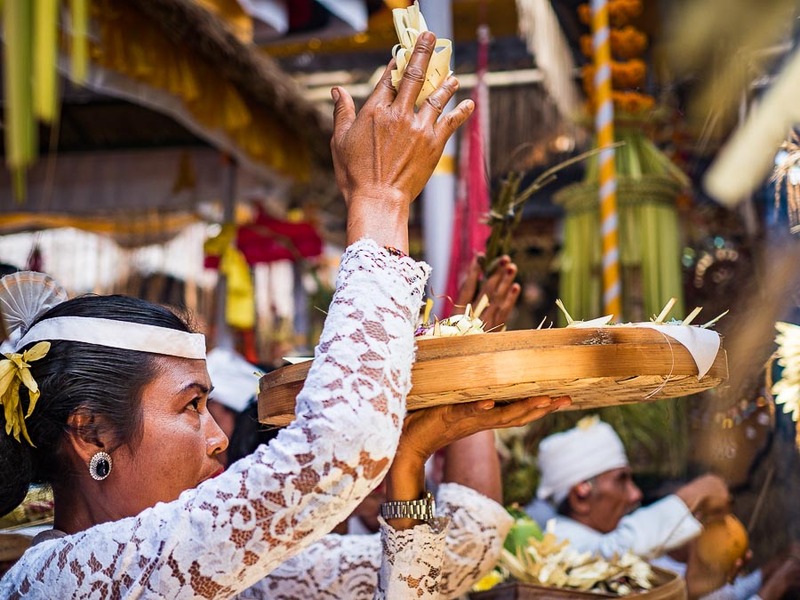 It was the full moon, which is always auspicious in the Hindu faith, and in the cycle of ceremonies it was an especially an important ceremony honoring the temple's founding. People, mostly men, wait for the ceremony to start. The ceremonies are not segregated by gender. The men, sat together so they could chat about the things Balinese men chat about. 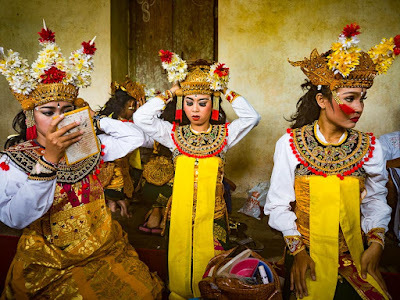 The women sat together and socialized about whatever Balinese women chat about. 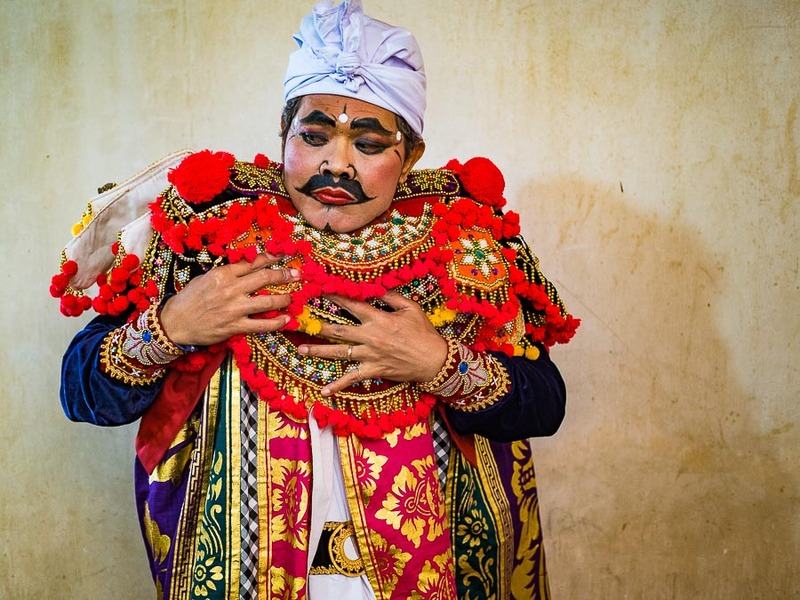 The temple was packed, everybody attired in their finest sarongs and traditional dress. 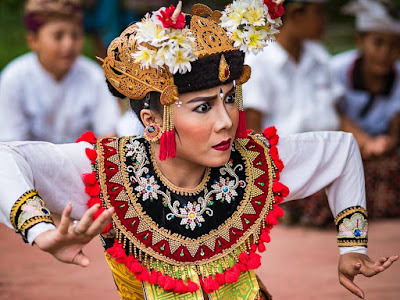 Balinese Hindus are very accommodating to outsiders - about the only restriction is that we have to wear Balinese attire. So I wore a sarong, sash and Balinese hat. In fact, I carried a sarong and sash with me everywhere I went on Bali because you have to wear the traditional attire anytime you go into a temple or a religious ceremony. But everywhere I went in the temple people were completely willing to be photographed or talk to me about the ceremony or Bali in general. Dancers prepare for a performance at the ceremony. A man gets into his dance costume. I saw the dancers getting ready in a small room in the temple. I knocked on the door and asked if I could photograph them and I was invited in. The only "rule" was that I not get in the way, which was difficult because the room was tiny, crowded and a beehive of activity. The ceremony was almost sensory overload. 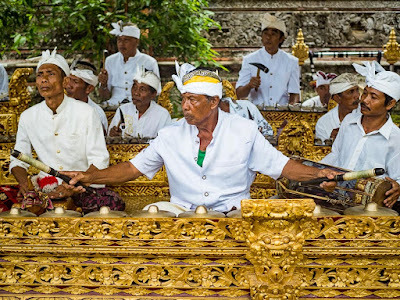 Traditional Balinese gamelan orchestras performed throughout the temple grounds, sometimes three orchestras playing at the same time. All playing different pieces of classical Balinese music. Then the dancers started. Multiple dance troupes performing at the same time in the temple's central courtyard, about the half the size of a basketball court. ...within a few meters of each other. But the ceremony isn't about music and dancing. After the dances, people took seats on the grass, in the heart of the temple or wherever they could, and prayed. Girls in a dance troupe lead a procession through the temple. Prayers in the main hall of the temple. The ceremony at Tampaksiring will go on for 11 days. Some days will be more active than others. The first and last days should be the most interesting. There are more photos of the ceremony in my archive or available from ZUMA Press.